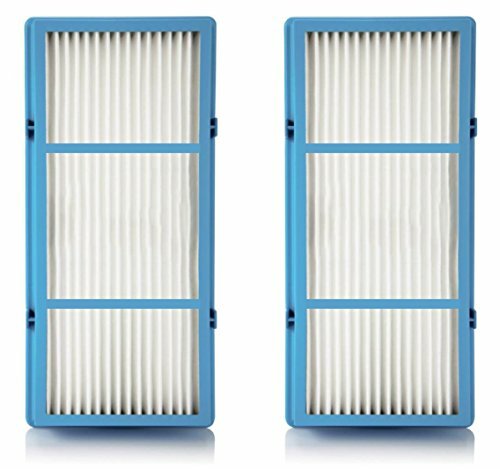 Premium HEPA filter replacement compatible with Holmes® aer1® total air HAPF30AT-U4R. Compatible with aer1® ready air purifiers. It traps 99.97% airborne allergens and contaminants from the air. Evidently improves the air quality. Compatible with Bionaire Units: BAP260, BAP815, BAP825, BAP9200, BAP9700, BAP520. Holmes Units: CAP531-U, CAP529-U, HAP240, HAP242, HAP412, HAP422, HAP424, HAP706, HAP716, HAP9240, HAP9242, HAP9412, HAP9414, HAP9422, HAP9424 This is not a Holmes® OEM product. The Holmes® brand names and logos are the registered trademarks of their respective owners. Any use of the Holmes® brand name or model designation for this product is made solely for purposes of demonstrating compatibility. It traps 99.97% airborne allergens and contaminants from the air. Evidently improves the air quality. It also helps deodorize any unfavorable household smell. Replaces A Filter, D Filter, K Filter. Dimension: 1.2 x 10 x 4.6 inches. 2 filters included.